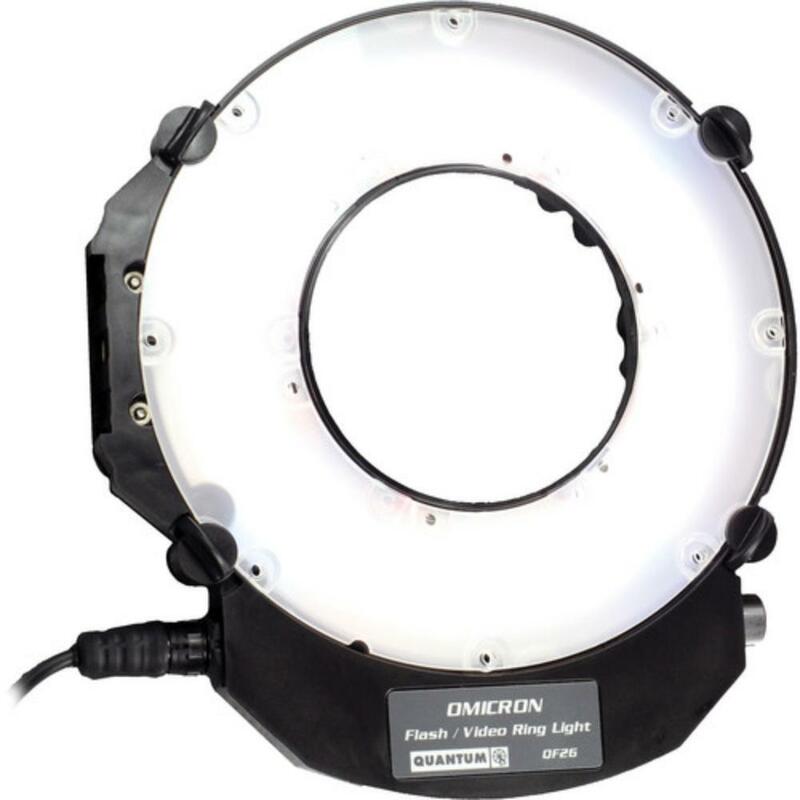 The Quantum Omicron OM3 Flash and Video Ringflash uniquely provides both strobe and continuous lighting suitable for photographers and videographers alike. With the provided box bracket and 15mm rod-ready rail mount (rods not included), this ringflash can be adapted for both 35mm cameras and video cameras that are attached to shoulder mount rigs. There are 80 color-balanced LEDs inside this ringflash and auto-tracking is enabled when in continuous mode to keep your subjects evenly lit even as you dolly in or out. This ringflash connects to AC power but a Quantum battery can be rented separately for on-location shooting. The Turbo3 battery pack (not included) will power the ringflash for about 2,000 strobe shots or 90 minutes of continuous video shooting. This ringflash accommodates lenses up to 3.9” in diameter. • This ringflash can be used as both a flash and a continuous light source. To fire it as a flash from your camera, you must used the provided sync cable that connects to the ringflash via the ACCY end of the cable to your camera via PC-in. It also comes with an ACCY-ACCY cable for triggering via a Freewire Transceiver (not included). • This ringflash powers on AC power unless you also rent a Quantum battery (not included) which you can connect to the ringflash via the included CQ2 cable. • TTL shooting is possible with this ringflash with use of the Quantum CoPilot, which is not included.